The Bandai Premium shopping site announced it will sell the Digimon Pendulum toy next year in a new 20th anniversary edition. The toy is the latest to get a re-release after this year’s Digivice 15th Ver. Metal Garurumon Color toy. The Digimon Pendulum toy was the second line to be released after the launch of the original Digimon toy. The toy takes its name from a mechanism requiring players to shake during training and battle sequences. The Digimon Pendulum first introduced the “Mega” or “Ultimate” forms and “Jogress” evolution. The new edition of the Digimon Pendulum will launch for pre-order on January 9. It will come in two colour variants “Silver Black” and “Silver Blue.” Both versions combined will contain over 200 different Digimon. New Legend-Arms (Weapon Digimon) will appear in the toy. Players will be able to raise two Digimon simultaneously to participate in tag battles. Depending on how many times people shake the toy during battle, Digimon’s attacks will gain strength. More details will be announced on the pre-order date. 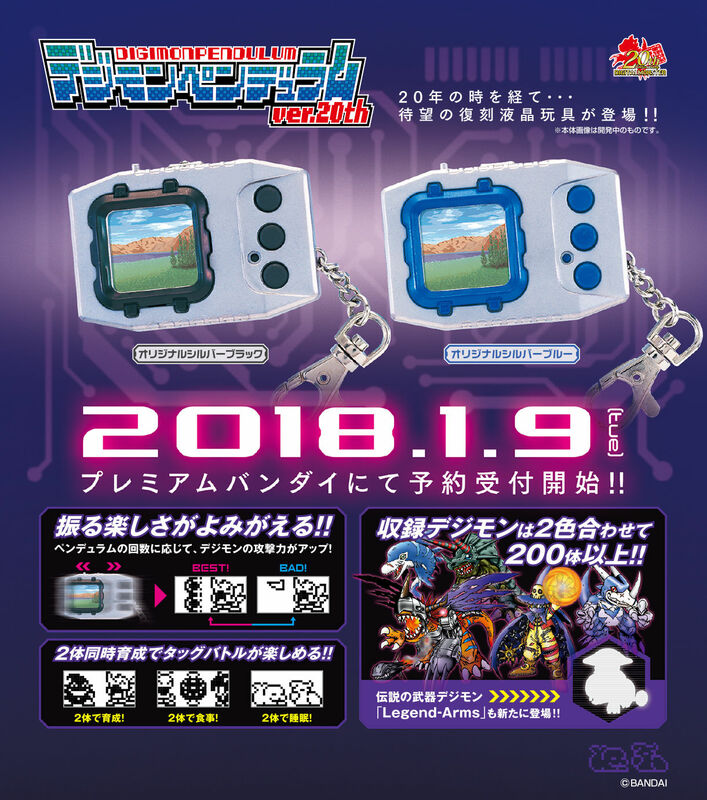 Bandai has previously reissued the original Digital Monster keychain toys, the Digimon Tamers anime Digivice and the D-Power items, and the Digimon Adventure 02 D-3 ver. 15th Digivice toys. Bandai also released its Digimon Adventure tri. Complete Selection Animation Digivice in 2015.